In 1731, the British merchantman Rebecca was boarded by the Spanish, and supposedly the Spaniards severed the captain's ear. It's a famous story, and one that was eventually used by Britain to declare war on their colonial rivals in the New World. This conflict merged with the War of Austrian succession, which bred several more conflicts in Europe, North America, the Caribbean, South America, and India. All through February, I'll be looking at images from the early 1740's. Sailors of this decade are the least examined of all in my blog, so I'll be spending quite a bit of time collecting and examining them. 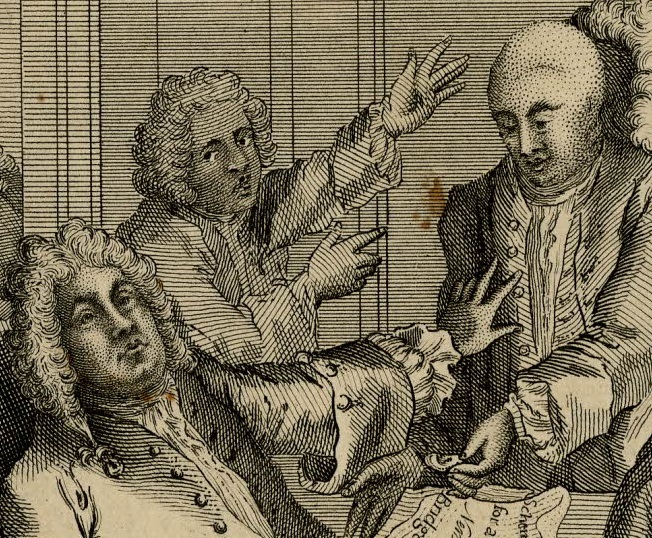 If you've got any favorite primary source images of sailors in the 1740's, let me know! Until then, enjoy this image of the unfortunate Captain Jenkins showing off the earless side of his head, and handing his severed flesh to an indifferent politician.